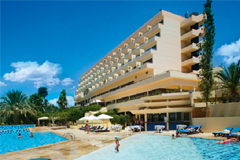 The Elias Beach Hotel is a luxurious 4 star seafront hotel, overlooking a ‘Blue Flag’ sandy beach in the ancient Amathus area, only a short drive from the entertainment area and city centre of the cosmopolitan town of Lemesos. mini bar, complimentary tea / coffee making facilities, and safety deposit box. •	Flavours Restaurant: Serves buffet breakfast, lunch and dinner to satisfy every preference, with an abundance of hot and cold salads and main dishes. •	Amadeus Restaurant: An haute restaurant for an à la carte evening meal. •	Blue Paradise Restaurant & Beach Bar: Serves a tavern-style menu with Mediterranean influences. •	Kiku Japanese Restaurant: Favorite dishes from the Far East with a modern twist, prepared on the spot. •	Splash Pool Bar: Enjoy cool refreshments, cocktails and ice creams right on the pool deck. •	Zodiac Cocktail Bar: A great place to relax any time of the day and enjoy a drink from the full bar menu. •	The Havana Venue: Offers daily changing evening entertainment in an ambience of fun and excitement. •	Mokka Café: Serves a full selection of different high-grade coffees, aromatic teas and a great range of sweet delights. 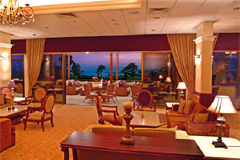 The Elias Beach provides a purpose-built conference room, and a separate multi-purpose venue, with a capacity of 220 and 120 guests. Modern audiovisual equipment is provided. The Hotel provides 1 outdoor fresh water pool, separate large children’s pool,1 indoor swimming pool with jacuzzi, floodlit tennis court, floodlit squash court, water sports, table tennis and billiard in Games Room, Serenity Health Club & Spa.